Word for Today: Farm to City and the Sheep of his Pasture. Thursday 7th June 2018. They were two families, single mums, of course, each with twins. They were in temporary accommodation and in a strange place. In a strange place where they were constantly looked at, even gawped and peered at, as if they were themselves something strange. At least it was warm and sheltered, and food and water readily available, and at night there was security. One family were highlanders, and the other white-faced Dartmoor. Yes, indeed, there are sheep by Clapham Junction! And pigs and calves and a tractor, with ducks, chicks and chickens, and a goose, not forgetting the turkey. Almost 300 have taken the organised tour, school children, young people, and other groups. Hundreds have stopped to peer on their way to work, at the Farm to City experience set up outside Providence House Youth Club on Falcon Road, Battersea. This is providing a unique, hands on educational experience each day this week for Battersea School children, culminating in a community day on Saturday 9th June. 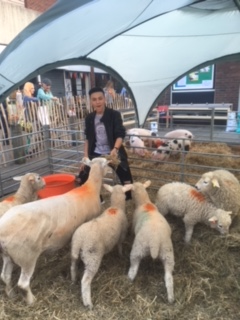 There are 12 learning activities to help bring alive something of the farming and food production to inner city young people, all put together in partnership with the Shallowford Trust and Providence House. Definitely worth a visit. Back to the sheep. Sheep are a great metaphor for community, and a great illustration for caring and being cared for. ‘Know that the Lord is God. It is He who made us, and we are His. Each of us, today, look to God for identity, for belonging and community, for care and protection.